I am a new ham (KN4IKI) and I have playing with FT8 since March of 2018. I wanted to show you this amazing propagation report I got on 20 meters using FT8, a Balun Designs dipole balun, and 12 gauge insulated wire from Home Depot. I recommend Balun Designs over and over on our FT8 Digital Mode Experimental group on Facebook. Just wanted to let you know that the 4116 arrived today and I have it installed at the feedpoint of my OCF dipole. I'm using the Icom 7410 with internal tuner. It works very well and I can see that the RFI resulting from using the Chinese balun seems to have disappeared. The internal tuner matches at various frequencies very quickly. Now I can be confident that my radiation pattern looks like what it should. This is a superb balun and I will definitely leave a 5/5 review for it on eham. Thanks again for a great product and your excellent advice. I thought I would have to alter the length of the feedline, but then I decided to try your 4124T that I bought back in August 2017 when I thought I had a balun heating problem (it wasn't). I had swapped back to the Palstar thinking I would use the 4124T outdoors at the base of a tree with window-line up to the antenna, but that project never happened. After I replaced the Palstar with your 4124T the SWR was 1.2:1 on 75m and 1.8:1 on 80m, both acceptable to my ALS-600s amplifier. It is flat on 40m/30m and 1.2:1 on the higher bands. Thank you for such a fine product. Today is Dec 2 2017. 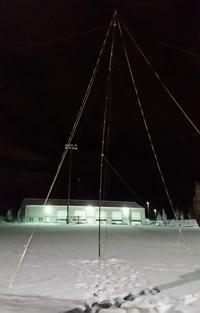 I recently installed an Inverted L for 160 meters and tried it out last weekend in the CQWWCW contest. It played ok, but my feed point resistance of 25 ohms was not matched well and it caused amp problems. So, I pondered what to do, and considered all sorts of options like running 2 50 ohm pcs of coax in parallel for impedance matching and winding a coaxial "ugly choke" to block common mode current (using elevated radials). Rather than taking those measures, I found "Balun Designs" and ordered their 25 to 50 ohm 5kw UNUN model 1235t. My amp (Yaesu Quadra) only does 1kw, but I wanted overkill ! This weekend, I am trying things again in the ARRL 160 contest using the Balun Designs UNUN and am pleased to report (after 224 qsos) all is working FB. It made my Inverted L "come alive". The UNUN accomplishes both impedance matching (swr 1:1) and common mode current blocking.. Kudos to Balun Designs. I’m new to the world of HF, and due to living in a townhome I’m in a difficult position when it comes to antennas. I made my own EFQW, and while it works suitably with my tuner the SWR is still higher than I like at times. A number of knowledgeable people told me that an EFQW didn’t need a balun, but if I’ve learned one thing over the years it’s that the more confident someone is, the less they tend to know. I opted to try one of your 4:1 baluns, as long with a 1:1 balun at the transceiver to see if it could help bring the noise down. To keep a long story long, your 4:1 balun brought my SWR down closer to 1:1, and my tuner now spends dramatically less time clacking away trying to clean up my mess! The 1:1 balun brought the noise down a notch or two, but more experimentation is needed on my part. I highly recommend Balun Designs products to anyone who needs a well-made balun but doesn’t want to pay military-grade prices. This short note is to congratulate you on the “behavior” of your latest balun 1116di, which I find excellent. At this particular time I am surrounded by several tall buildings under construction, and you can imaging the electrical noise coming from gasoline engines of pumps, winches, and concrete mixers of all sorts in the surroundings, and coming from several buldings in a choir of sorts. Finally got the model 4932 unun installed that I purchased last year. I wanted to let you know how happy I am with the quality and performance. 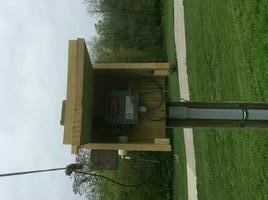 The neighbors even like my "electronic birdhouse". What more can you ask for? Thank you for your good service. I received the two 1116i isolation baluns two days after they were shipped. I installed one of the isolation baluns at the transceiver end of the antenna feed line from my HYEnd end fed antenna and I can can now actually use and type on my laptop while the radio is in transmit mode without the laptop cursor freezing and losing control of it. The second balun is destined for an antenna at my vacation home where I have the same computer problem while transmitting. thank you very much for the products that l purchased some time back. the quality is the best l have seen . l could not resist temptation and removed the cover of one only ocf 4;1 balun, l was like an art critic looking over a canvas painting. more than l expected the quality and precision all exacting, just perfect and yes all work perfectly. thank you again bob, magnificent products. For Winter Field day we used both the 4115 and the 4132. And the vertical was very functional used a small manual tuner and only the inductance needed slight changing. So , HUGE thank you very fine work on your product. I only have a snowy picture because it snowed while we put the antennas up and everything was buried when we packed up the gear. I am sending you a photo (its dark and a bit hard to see), You will see the 43 vertical that is doubling as a mast, there is a pulley at the top which we used to raise the OCF to 40 foot. Both antennas were literally touching. I used an antenna switch to use one or the other. The biggest issue I have (with the U******) is the tendency of the core to saturate during longer operating sessions. A friend is running his end fed with a Balun Designs 5KW 9:1 (Model # 9135) using the same configuration, wire gauge, counterpoise, etc I use. There is no comparison. The Balun Designs 9:1 absolutely blows away the U****** matching unit. Lower SWR across the bands, no saturation, and the core stays stable. I have ordered a 9135 but will keep the U****** unit as a back up. I use your UnUn 9130 for about 1 month in various locations in Chad with the following setup. Radio Kenwood TS-50 + MFJ-971 portable tuner + 7 meters of RG58 cable to connect the UnUn 9130. In some places I use only 12m of 1mm wire and on other location have used 26 meters, but I always been able to tune the antenna for a low SWR value. The setup worked very well, especially with a good length or wire, I made QSO with all continents. 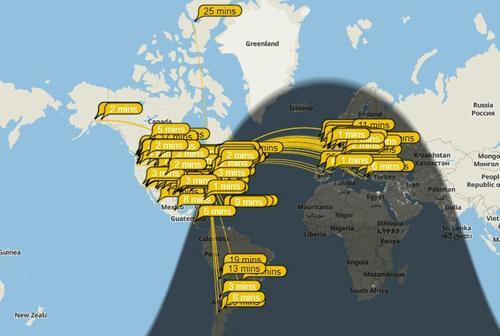 Also worked Japan on 80m, VK, EU, USA on 40m. I just received the 4114ocf balun and was interested to see what was inside. It's some of the nicest workmanship I've ever seem. It loooks like mil-spec quality. I have no doubt it will work as expected on a 80-10 OCFD. Thank you so much for providing your services to us in the amateur community. I recently purchased two Model 16132 UNUN’s (32 to 50 Ohms). I have installed each UNUN on “home brew” 40 meter band 1/4 wavelength verticals, 1) a portable ARRL Field Day antenna with three insulated radials and 2) a fixed station vertical antenna with four insulated radials. Both UNUN’s replaced DX Engineering 1:1 baluns. When installed and tested, the Balun Designs UNUN’s have greatly improved the performance of both antennas with lower VSWR and wider bandwidth. Your balun and UNUN engineering design and quality production is outstanding! (who purchased) and am about to today order another one to help yet another buddy of mine install a decent end-fed wire. of their rigs' built in 'antenna tuner' making them think that all is well. Take care and have a blessed Thanksgiving. Just wanted to drop you a quick note about the balun I purchased. As I said on the phone, I have learned that you get what you pay for! Thank you for a super quality product. My SWR’s on 20, 40 and 80m are all 1.3 to 1 or lower. My receive is so much quieter and I’ve hammered this thing with legal limit all weekend and worked the world with no issues what so ever! This balun does not saturate!! A quality product made with pride in the USA. I assure you I have become an unofficial salesman for Balun Designs! Thanks again Bob, I will be making future purchases from you this fall when I put some more wire in the air!! Got my balun Friday, but didn’t get it installed until yesterday afternoon. 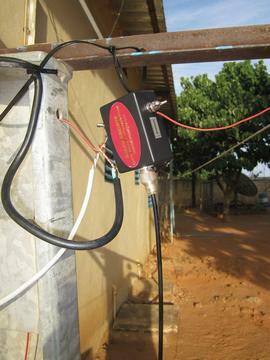 It is used with a new Cobra antenna - 140 ft long and they suggest at 4:1 balun. I have been using this antenna with my Flex 1500 and a couple of more traditional rigs. The balun I had been using was a 4:1 that I acquired a long time ago and probably didn’t spend much money on it. So far this combination seemed to be working OK, except that I noticed that a local broadcast station I listen too was about S-7 instead of 10-15 over 9 that I had with the previous antenna (a G5RV, no balun). A friend of mine who has the perfect station, all coax lines are dressed at right angles, and there is no clutter in his shack, suggested your balun. Last night, after getting your balun installed, I noticed that the receive on every band was better. I was even copying a YI1 on 30 meter JT65. What was really cool was that today when I tuned in the broadcast station instead of being S-7 with the Cobra and my old balun, it is now 20 over. They lesson here is get the real deal, not some cheap look-a-like. Thanks for building great products.